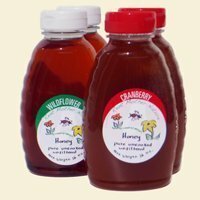 Fill your pantry with a variety of New England all-natural honey (16 oz. jars) fresh from our hives. We strategically place our honey hives among wild berry and herb patches so the bees produce blossom-specific honeys. These superlative raw honeys, with distinctive flavors, have all their nutrients intact.